In case you don’t know what Fluent is, it’s a localization system designed and developed by Mozilla to overcome the limitations of the existing localization technologies. If you have been around Mozilla Localization for a while, and you’re wondering what happened to L20n, you can read this explanation about the relation between these two projects. With Firefox 58 we started moving Firefox Preferences to Fluent, and today we’re migrating the last pane (Firefox Account – Sync) in Firefox Nightly (61). The work is not done yet, there are still edge cases to migrate in the existing panes, and subdialogs, but we’re on track. If you’re interested in the details, you can read the full journey in two blog posts from Zibi (2017 and 2018), covering not only Fluent, but also the huge amount of work done on the Gecko platform to improve multilingual support. At this point, you might be wondering: do we really need another localization system? What’s wrong with what we have? The truth is that there is a lot wrong with the current systems. In Gecko alone, we support 4 different file formats to localize content: .dtd, .properties, .inc, .inc. And since none of them support plural forms, we built hacks on top of .properties to support pluralization. Here are a few practical examples of why Fluent is a huge improvement over existing technologies, and will allow us to improve the quality of the localizations we ship. Why the empty string at the end? Because, while English doesn’t need it, other languages might need to change the structure of the sentence, adding content after the email address. On top of that, some localization tools don’t support empty strings correctly, not allowing localizers to mark an empty translation as a “translated” string. One single string, full visibility on the context, flexibility to move around the email address. Plural forms are supported in Gecko only for .properties files. Fluent supports plural forms natively, and with a lot of additional flexibility. English, like many other European languages, only has 2 plural forms: n=1 uses one form (“1 page”), all other numbers (n!=1) use a different form (“2 pages”). Sadly, this makes a lot of people think about plural in terms of “1 vs many”, while that’s not really the case for most languages. French still has 2 plural forms, but uses the same form for both 0 and 1. Other languages can only have one form (e.g. Chinese), or have up to 6 different plural forms (e.g. Arabic). Fluent uses the CLDR categories (zero, one, two, few, many, other) to match a number to the correct plural form. For example, in Russian 1 and 21 will use the form “one”, but 11 will use “other”. The behavior might change if the actual number is present or not. For example, Turkic languages don’t need to pluralize a noun after a number (“1 page”), but need plural forms in sentences referencing to one or more elements (“this” vs “them”). Consider for example this use case: in Firefox, the button to set the home page changes from “Use Current Page” to “Use Current Pages”, depending on the number of open tabs. This will force languages to create all plural forms for their locales, even if they might not be needed. If your language has 6 forms, you need to provide all 6 forms, even if they’re all identical. Fun, isn’t it? Note that this is not just a limitation of the plural system used in .properties, the same happens in GetText (.po files). In Russian, the “[one]” form would be also used for 21 tabs, while here it’s only used for 1 tab. This is one of the most exciting changes introduced to the localization paradigm. Consider this example: “Firefox Account” is a special brand within Firefox. While “Firefox” itself should not be localized or declined, “account” can be localized and moved. In Italian it’s “Account Firefox”, “Cuenta de Firefox” in Spanish. In Italian this results in “Connetti &syncBrand.fxAccount.label;”. It’s not natural, and it looks wrong, because we don’t capitalize nouns in the middle of a sentence. My only option to improve the translation, and make it sound more natural, would have been to drop the entity and just add the translated name. That defies the entire concept of having a central definition for the brand. Here’s what I can do in Fluent. The brand is defined as a term, a special type of message that can only be referenced from other strings (not code), and can have additional attributes. While uppercase vs lowercase is a trivial example, variants can have a much deeper impact on localization quality for complex languages that use declensions, where the word “account” changes based on its role within the sentence (nominative, accusative, etc.). 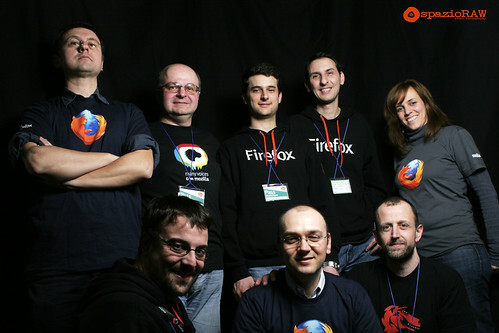 Today is a sad day for Mozilla, not just for the Italian community but for the Mozilla Community as a whole. We just learned that Giuliano Masseroni, aka jooliaan, passed away last night. jooliaan, even if he hasn’t been active for a few years, had a crucial role in the growth of the Italian community and the creation of the legal association known as Mozilla Italia, as Vice President first, then President, and administrator of the local support forum. If you’re using Firefox in Italian, or seeking and getting help on the forum, it’s also thanks to his work and dedicated contribution. Today we’re sharing in the pain of his family and friends, remembering a person, a friend, who’s given a fundamental contribution to the history of the Open Source in Italy and Mozilla, and to our own lives. PHP might not be hugely popular these days, but it’s a fundamental part of the tools I use everyday to manage localization of web parts at Mozilla (e.g. 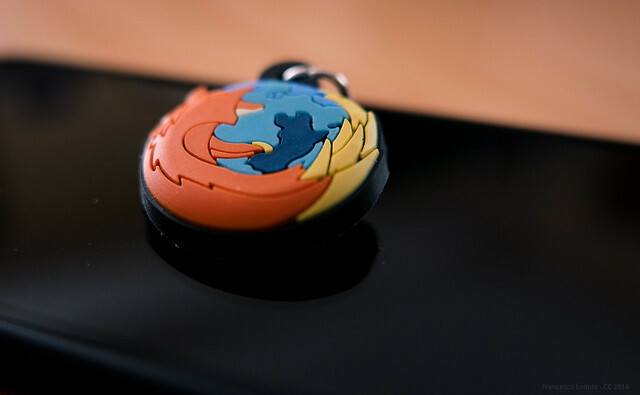 mozilla.org). Today I’ve decided to give PHP 7 a try on my local virtual machine: it’s a pretty light VM running Debian 8 (2 GB ram, 2 cores), hosted on a Mac with VMWare Fusion. Web pages are served by Apache and mod_php, not by PHP’s internal web server, and there’s no optimization of any kind on the config. Since I and my colleague Pascal spent quite a bit of time improving code quality and performances in our tools during the last year or so, I already had a script to collect some performance data. I ran the test against Langchecker, which is the tool providing data to our Webdashboard. While the number of runs was pretty small (50 for each request), I got decently consistent results for memory and time. 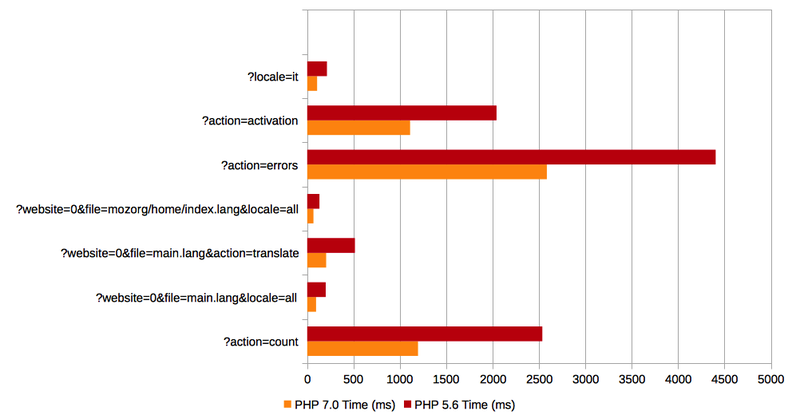 And the results speak clearly about the performance improvements in PHP 7. 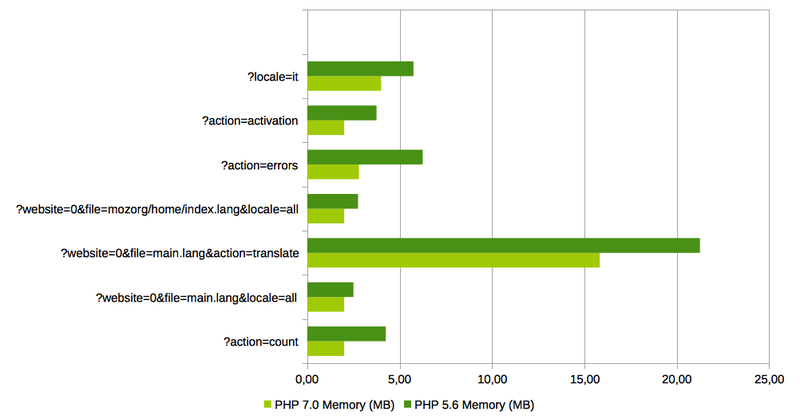 I don’t personally consider PHP 7 ready for a production environment but, if you can, it’s definitely worth a try. In our case the code didn’t need any change. If you never noticed the menu item in this blog, I’m the developer of a small add-on for Firefox called BBCodeXtra: it’s an extension, started about 10 years ago, that makes posting on forums and other places (e.g. GitHub) a little less painful. This extension, currently at version 0.4.1, is localized in 16 languages: de, es-ES, fi, fr, he, it, ja, ko, pl, pt-BR, pt-PT, ru, sk, sr, th, zh-TW. For the first time in years, I’m going to release a new version that includes new features, and therefore new strings. While I obviously love localization and localizers, I don’t intend to work with localization platforms for an add-on with a very limited set of strings and infrequent updates. The new version (v0.5.0) will be released with all the existing languages enabled, but the new strings will be left in English (excluding Italian). Starting from the next version, I will drop locales that go below 60% unchanged strings (currently it’s about 70% for all locales). Source code is hosted on GitHub. Localizations are stored in /extensions/locale. If you’re already familiar with GitHub, great. If you’re not, you can try with this tutorial or try using the online editor available on GitHub. If you want to receive an email before the next release, in case I have to add new strings and you want to localize them before release, send me an email at flod(at)lodolo(dot).net and I’ll organize a mailing list. “Subtitles” assume the viewer can hear but cannot understand the language or accent, or the speech is not entirely clear, so they only transcribe dialogue and some on-screen text. “Captions” aim to describe to the deaf and hard of hearing all significant audio content—spoken dialogue and non-speech information such as the identity of speakers and, occasionally, their manner of speaking – along with any significant music or sound effects using words or symbols. One of my many resolutions for 2015 is to blog more, both here in English and on my Italian blog, which just turned 10 last September. Keeping a diary of what happened in the last months can be useful, and it’s definitely a good exercise for me, so I’ll try to make a habit of posting a summary of my quarters like my teammate Pascal does. So I had to check it somehow 😉 (in Italy they would call me Saint Thomas for being skeptical). 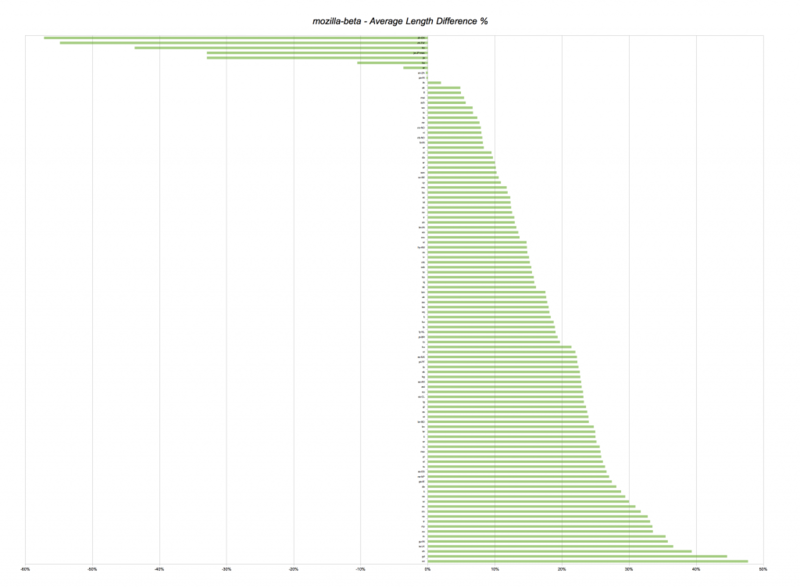 The basic idea was simple: use Silme to analyze all locales available in Mozilla l10n repositories, comparing string lengths between English and another language. Here’s the resulting Python script (beware my slowly improving programming skills) and a table with the results (data can be sorted by clicking on column headers). I’m using mozilla-beta as a reference, and comparing each locale against en-GB. Why not en-US? The reason is simple: en-US strings are scattered across the entire mozilla-central repository, so I should do tricks like Transvision in order to create a pseudo en-US string-only repository. Using en-GB leads to less precise results (see below), but for the sake of this analysis I considered it an acceptable compromise. I’m not checking all folders, only the main ones (‘browser’, ‘dom’, ‘mail’, ‘mobile’, ‘netwerk’, ‘security’, ‘services’, ‘suite’, ‘toolkit’, ‘webapprt’). This still generates an archive of almost 18,000 strings for locales translating all products, so it seems a decent sample. 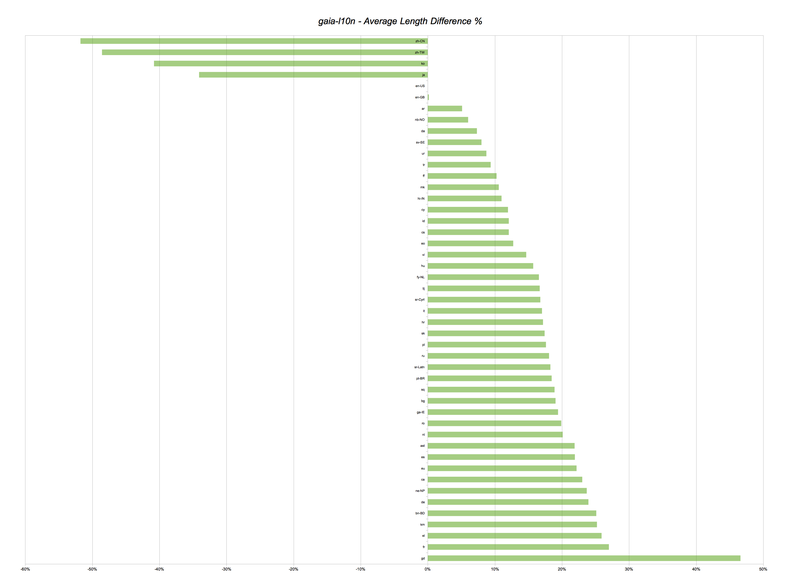 Average for locale X: -1 characters, +25% (sum of differences divided by total number of items). Not sure if this is the best choice, but I couldn’t think of an alternative. Note also that I’m ignoring single character strings (access keys, shortcuts). In the table you’ll see a global column (average results) and “buckets”, with string groups based on en-GB original length. Too bad these groups are often unreliable because of the “concatenation conundrum”, where one string could be created by concatenating 3 different labels. sentence.after = è veramente interessante. Do you see what just happened here? Length comparison based on groups just became less interesting, both averages and maximum/minimum differences. Anyhow, here’s a good image (graph based on global difference in percentage) that I’d like to call “Why using English as a reference for designing UI may not be a great idea”. Why not use Gaia directly? Most locales already did at least two rounds of QA, so a lot of strings have already been (heavily) shortened to fit in the UI. So data could be less useful and interesting. Several locales are incomplete on gaia-l10n. 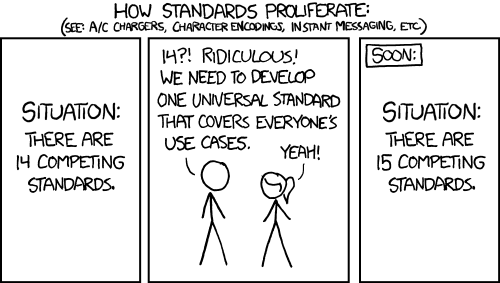 For this very reason I excluded all locales with less than 1000 strings translated. Here’s the same table for Gaia. And, again, a similar graph based on global difference in percentage. We know that en-GB is 0.16% longer than en-US, at least on Gaia. A simple word as “OK” (2 characters) can become as long as “Kulungile” (9) in Xhosa, or “Ceart ma-thà” (12) in Scottish Gaelic. Note: this is a guest post from Iacopo Benesperi, a fellow Mozillian from the Italian community. This week-end took place in Mozilla’s Paris office the Summit 2013 planning assembly: a gathering of about 65 people from all around the world and representing all areas of the Mozilla project, with both paid staff and volunteers, aimed to plan and shape the next Summit, that will take place the first week-end of October in Bruxelles, Toronto and Santa Clara. TL;DR: it’s been a great assembly. If we manage to accomplish at the next Summit half of the things we’ve discussed in this week-end, it will have been the best Mozilla event ever. The aim of the assembly was not to define a schedule for the event and fix everything but to talk about which are the important topics that animate the Mozilla project these days, start to discuss them and shape them in a way so that we can come out with a good format for the Summit to address them and try to give and propose solutions for them. To do this, all the planning committee has taken interviews to fellow Mozillians in the last month to have a wider view of which is the temperature of the project in these days and act as a representative for the comments expressed. I went to Paris without a clear idea of what we would have accomplished there, but I’m impressed with the result we had. First of all, this assembly was facilitated by people of unconference.net, who proposed a peculiar way to proceed with it. I was a bit skeptic with the method proposed, but it turned out that some of their methods are really great (like unpanel) and we will definitely adopt them for the next Summit, while some others still look like rubbish (I may still be proved wrong). The second important fact is that we talked little about technology and a lot about Mozilla, its community, its communication (internal and external) and the interactions between its components and people. On one hand, as Gandalf pointed out, this is a sign that we trust implicitly our technology and the fact that it will be discussed at the Summit, because this is a big portion of what Mozilla is about. On the other hand, it’s a sign that there’s a general awareness, not only among community members but also (finally) among employees and paid staff and board of directors that we have communication problems between the different parts of the projects and especially between paid staff and volunteers, and the time is now mature to address and try to solve them. What I’m talking about is not only communication to get things done but also communication related to the decision-making process. So, it will be interesting to experiment discussions around different time-zones and locations. I will probably post more about the assembly and the planning for the Summit in the next days, when ideas and thoughts will have settled down a bit and I’ll have had the time to read all the ideas and documentation we produced during this two days. What I felt important to communicate immediately is the fact that the next Summit will be a wonderful occasion to talk not only about our technologies but also about who we are, what we want to do and where we want to go. It will be an occasion for the community to teach and mentor the newest community members and more importantly all the new employees to let them understand and feel the power and importance of our community and it will be, in general, an occasion to have our voice finally be heard and taken into consideration not only in the tasks at hand, but in building the new policies and guidelines that will drive all the project in the future. I’m sure we’ll try, in the next months, to provide some initial information and documentation about what have been discussed and decided so far so that you can arrive at the Summit prepared to give your contribution to the conversation, so that we can take the most out of the Summit and make it really matter in our future. As I said at the beginning: if we manage to discuss and propose solutions to half of the problems and concerns raised during this two days, we will have had the best Mozilla event ever; one that will have strengthened and made our project more mature. Last weekend, March 15-17, Mozilla Italia took part in Fa’ la cosa giusta 2013 in Milan (Fa’ la cosa giusta means Do the right thing!). For our association this was the fourth time in this particular event: we participated from 2007 to 2009, then we moved to Florence for a couple of years (event called “Terra Futura”) and took a break in 2012. In Milan there were six active members from our community, which is quite a gathering considering how spread we are through Italy, and two guests who helped us during these three days. Citing from the official site: Fa’ la cosa giusta is a fair about ethical consumerism and sustainable living, with over 700 exhibitors hosted on 29,000 square meters. This year edition had more than 72,000 visitors, among them 3,300 students from 17 different schools. The number of tech-related exhibitors is always quite limited: for example near our booth there was an area where people from Ubuntu and Document Foundation had talks about their communities and their products, there were also other realities like a lab which takes in old IT hardware (printers, computers, etc.) and restore them, or even low cost 3D printers (Waspproject). Taking part in this kind of events, compared to more tech-oriented exhibitions, has some positive aspects. For example trying to explain the Open Web, or the importance of web standards and diversity to people who can’t really understand the difference between a browser and a search engine is quite a challenge (Q: “What software do you use to browse the Internet?” A: “I use Google.”). At the end of these three days we welcomed a lot of people at our booth, even a couple of puppies: some of them wanted help for some problems they were having with Firefox or Thunderbird, some others wanted to know more about Mozilla or just say hello to us. How and when will Firefox OS be commercialized? Distribution should start soon in some countries (e.g. Spain, Brazil, Poland, etc. ), and then cover other areas. In the meantime people, in particular those interested in developing Apps for the new OS, can try Firefox OS with an emulator or desktop builds. 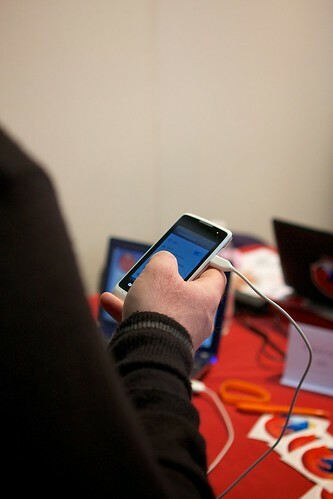 When will Firefox OS be available in Italy? Well, we don’t know 😉 Personally I hope at some point during 2014, considering that Telecom Italia is listed among the partners on the official page. Will I be able to install Firefox OS on my phone and replace Android/Windows? It depends, but it can’t be excluded given the open nature of the project. Since it probably looks like my favorite hobby is whining without a reason, let’s check what happened so far (always an optimist…) in this cycle. Landing strings in Beta means that we did something wrong before (haste of moving forward features that weren’t probably ready, “we need this in ESR”, etc.). Consider several adding/removing strings both in beta and aurora (e.g. Bug 803630 or Bug 760951) and you’ll get the picture. For a starter a better review process could have avoided all this.